Volkswagen Australia has today unveiled the fruits of its industry-wide collaboration project, dubbed the ART3on: a track-ready customised Arteon Art Car, built by a team of Volkswagen apprentices and mentors from the Australian automotive aftermarket industry. The car has been built as part of Volkswagen Australia's second-ever Apprentice Build Challenge, which sees a small cohort of high-achieving Volkswagen apprentices selected to take on a unique build designed to test their skills and offer them invaluable industry experience not available in a typical automotive apprenticeship. 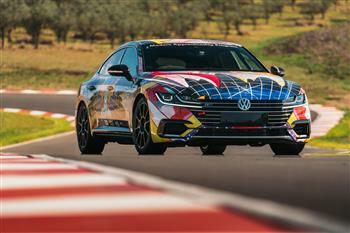 The 206kW Volkswagen Arteon turned into 360kW/600Nm ART3on race car, to debut at 2018 World Time Attack Challenge event in Sydney 12th and 13th October.